"I would like to thank USA Silos for their prompt service during our recent outage of our ash handling unit. Your crews arrived on site on the promised day and wasted no time in getting to work on our silo. Your crew removed the ash clinker buildup much quicker than we have experienced in the past. We appreciate USA Silos’ timely response, the crew’s attention to safety and the “get in, get done, and get out” nature of the company. Thanks, and we will keep you in mind the next time we need a silo cleaned out." "Thank you for your recent service at our cement terminal. When material quit coming out of our hopper, it was a real emergency situation. Your crews responded right away and resolved our issue in remarkable fashion. Your timely response minimized our unplanned downtime. And not only was USA Silos’ response time exceptional in our experience, but your attention to safety of both your crews and our plant personnel was noticed and appreciated." "Fantastic...timely, hard-working, safety minded and results delivered. Our company was having issues with water getting into the product from roof leakage. USA Silo Service came out and inspected the current condition of our silo roofs, prepared a proposal and were on site within a week recoating the silo roofs. Fabulous work - the roofs no longer leak, and they look brand new!!! Thank you so much for providing a professional service to our company." "USA Silo Service has been efficient and proactive, particularly in meeting our operational scheduling & outages to complete specific scopes of work. Their added value as the industry leader in solving specific issues and the support via internal staff are unparalleled. USA Silo Service strikes just the right balance between being a flexible, easy-to-deal-with local firm, yet having all the key strengths, attributes and tenacity necessary to support a major corporation. I am particularly indebted to the field personnel and on-site superintendent that committed to and successfully executed the challenge of recoating our bin roofs in a very short time frame. Job completed flawlessly, cost effective, safe and in our time frame. Tremendous achievement." 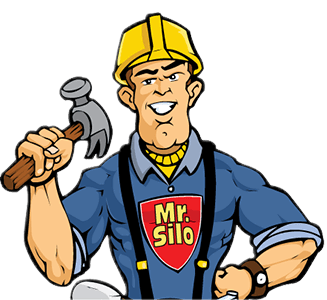 "I continuously count on USA Silo Service for all my silo cleaning needs. I have been a Cement Logistics & Terminal Manager for many of my company’s terminals located throughout the central United States. I have annual needs for silo cleaning services and have used most of the service providers in the country. USA Silo Service has, for many years, been my favorite service provider. They consistently provide top notch service. Their silo cleaning machine seems to always get the job done quicker and can handle the toughest of jobs that some others can’t. That saves me money in my operating budget. I can’t say enough good things about their staff. They always are clean, courteous, safety conscious and hard working. I never have an issue with their service and thus they are my number one provider." "I want to personally thank you for assisting us in cleaning and sealing our flour silo. As you know, we have had multiple problems with our silo and contamination of our flour. Your quick and speedy action of cleaning our silo helped us resume operations with minimal downtime. Your help in determining why we were having problems with roof leaks and installation of your roof coating has prevented any further problems with our flour. We are truly appreciative of your commitment to our needs! Thank you!" "USA Silo recently cleaned out our 70' X 160' concrete raw coal storage silo located in southern West Virginia. This silo was suffering from asymmetric flow issues and had become filled with multiple rat holes and stagnant, non-moving coal. This situation can lead to spontaneous combustion of our stored raw coal. We contracted with USA Silo to remotely clean the compacted and stagnant coal from our silo. USA Silo’s personnel arrived in a matter of a couple days when we had a shutdown. I was impressed with the speed of their setting-up and installation of their cleaning machine. They quickly completed the process of removing the stagnant coal from our silo and we were ready to return to operation within a couple days. I would highly recommend USA Silo for any silo cleaning project you may have." "I am writing to express my gratitude for the excellent work the USA Silo crew exhibited during their short visit to our site. We contracted USA Silo to clean out a 30’ diameter by 84’ tall cement silo at our facility in Indiana. Due to a production issue we encountered on our silo, we were left with about 15' of hardened cement inside the silo which halted all production. With production stopped, we knew we needed an experienced cleaning contractor to arrive on site at a moment’s notice. After contacting USA Silo about our issue we were very pleased to discover USA Silo could have a crew on site the same week. Safety is paramount on our facility. We take pride in providing a safe work environment for all personnel who step foot on our site. After having your crew on site for 4 days, I am happy to say USA Silo exceeded all expectations when it came to safety and proper housekeeping. All personnel arrived on site with the proper PPE and training certifications we required. After the crew finished our site specific training, they wasted no time getting to work and setting up all the necessary equipment. The crew foreman even took the extra time to barricade some delicate equipment we had located near the discharge chute of the silo to ensure it would sustain no damage while the silo was being cleaned. Although I hope we do not encounter another production issue with any of our silos, I would not hesitate to make USA Silo my first phone call. I applaud your cleaning crew and everyone involved in bringing our silo back to service in such a short time frame."